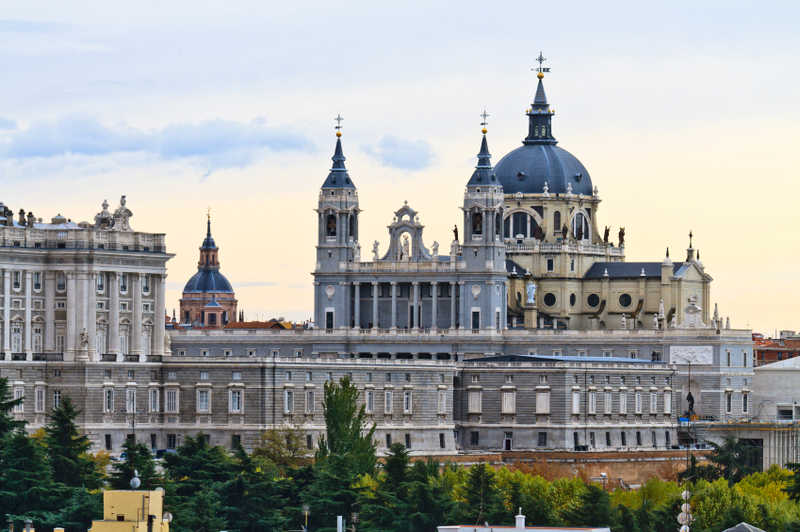 How To Spend Three Days In Madrid | From Europe and beyond. As I’ve mentioned before in previous posts, I will always have a sentimental attachment to Madrid as it was the first place that I’d ever been to on my own, followed by moving there a few months later. Madrid stuck by me while I sorted myself out and made me a much happier person than the one I was before I moved out there. A great way to start in any City is with a walking tour. You can either find a free one that you’d like to go to with New Madrid Walking Tours or you could do your own similar to the one I’m going to lay out for you. Here is a map that I’ve made quickly using Google Maps. Look out for the theatre showing the Lion King, if you’re really lucky then you might catch someone taking a quick breather in their costume. Stop at 100 Montaditos for a cheap beer or Sangria in the sun accompanied by 1€ sandwiches, yaaaaassss. Check out the famous Teatro Real, Madrid’s opera house. The interior is stunning & make sure you keep an eye out for cheap Opera tickets, as a friend and I managed to pick ours up for 70% off of the original price as we were under a certain age (I’m sorry, I can’t remember what that is now). Although the Royal Palace is the official residence of the Royal family, they now live elsewhere and use the Palace solely for official functions. The palace is absolutely huge with a grand total of 2800 rooms. 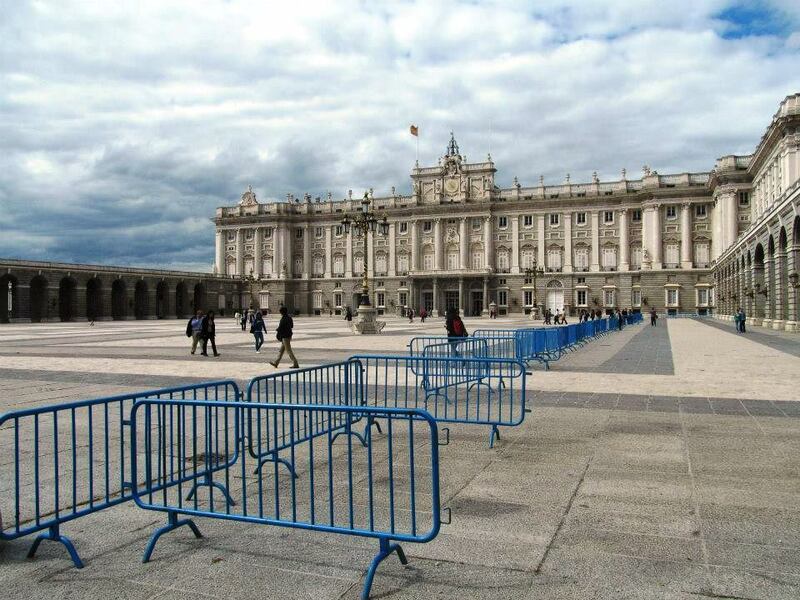 Coming from London and growing up not too far from Buckingham Palace, the nice thing about Madrid’s Royal Palace is that you are able to walk all around it, rather than up to the gates of Buckingham Palace. I felt a little let down by the tour inside of the Palace, as there is only a section that you can walk around. For me the best parts were the staircase in the entry & the dining area where functions are held. It is worth doing the tour to be able to walk around the grounds of the Palace and channel your inner Royal. Make sure that you spend some time to wander round the Palace’s gardens too. Just across the way from the Palace you will find the Cathedral where Felipe and Letizia, the Prince and Princess of Asturias were married in 2004. In true Spanish, Catholic tradition the Cathedral is grand and beautiful, and comes complete with confession boxes in the corners. This is one of my favourite spots in Madrid. It’s always jam packed with people all there with the same goal, to enjoy all of the food and red wine available. Although it is a pretty touristy spot, the prices remain extremely reasonable which is quite rare for tourist spots. 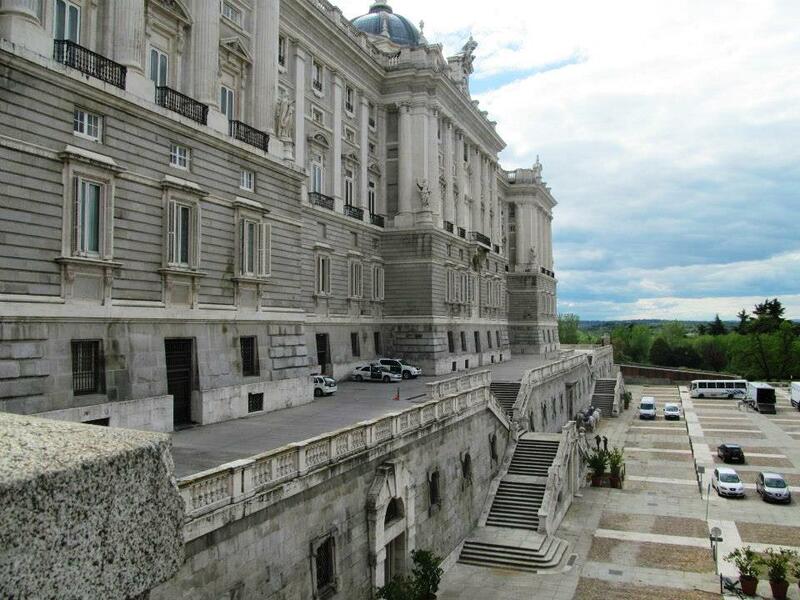 The most famous Plaza in all of Madrid was once host to bullfights, tournaments and even executions. Present day finds it a lost less dramatic and a lot more touristy. Here you can indulge in some people watching, watch the performers and generally lose yourself to the buzzy atmosphere. I wouldn’t recommend sitting down for anything to eat or drink here, as you will find yourself overcharged, but do take a wander around. 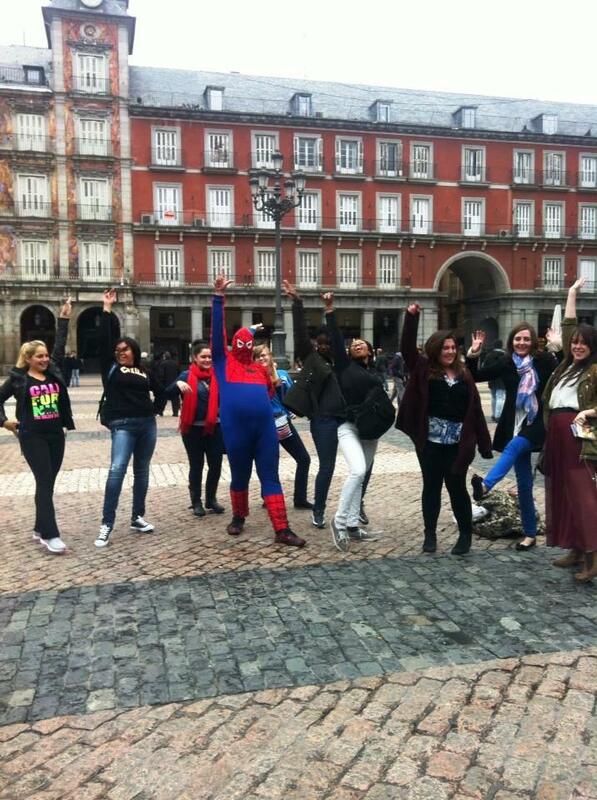 Hey, you can even get a couple of photo’s with Spider Man, who has slightly let himself go since the movies. Sol is a short walk from Plaza Mayor, and along the way you will be able to watch talented artists doing their thing using spray paint and a canvas in the street. Sol is another cool place to people watch, and there are also a lot of great high street stores dotted around if shoppings your kinda thing. Once you’re finished here, take a 2 minute walk to my favourite bar in all of Madrid for some red wine and free tapas. It’s called Malaspina & comes equipped with delicious tapas, a great atmosphere, lovely staff & really cheap wine. Speak to any Spaniard and you will find that there are a couple of things that every one of them will rant and rave about being proud of. Their culture, their family and possibly the most important of them all… their food. Speak to a Spanish person about a tortilla con patatas that you had earlier, and they will tell you about how amazing their grandmother’s is. So for day two in Madrid I would highly recommend taking a food tour. 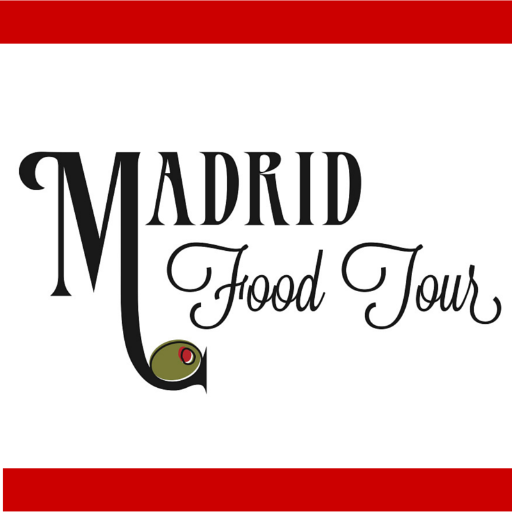 I would recommend checking out Madrid Food Tour for an array of different experiences run by people who live, breathe and most importantly, eat Spanish food. 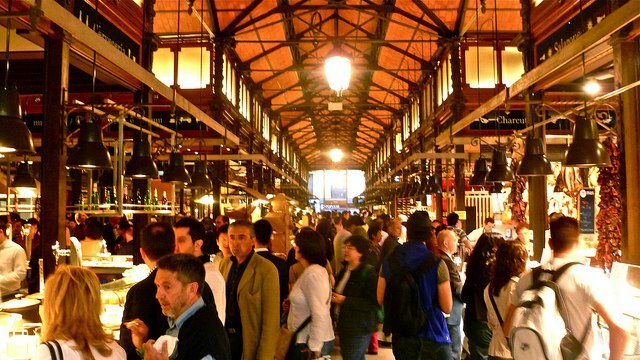 Most of their tours last about 4 hours and you will be treated to a huge selection of tapas, a well informed tour guide, restaurants off the beaten track, challenges, behind the scenes of how the food is made, and in depth History on not only the food, but Madrid too. 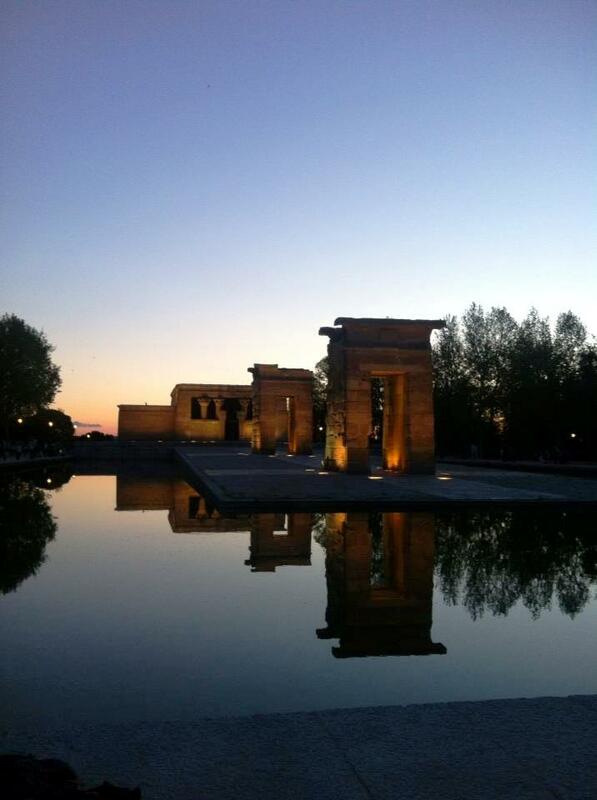 Amidst all of the cities craziness you can always find solace waiting for you at the Templo de Debod which is one of my favourite places in Madrid. Watching the sun set from up there is a must, followed by some drinks at the ‘botellon’ which always takes place there at night. Note: The temple was originally built in the 2nd century in Egypt, but was given to Spain in 1968 as a will of gratitude for helping to save the Abu Simbel temple from flooding by the Aswan Dam. 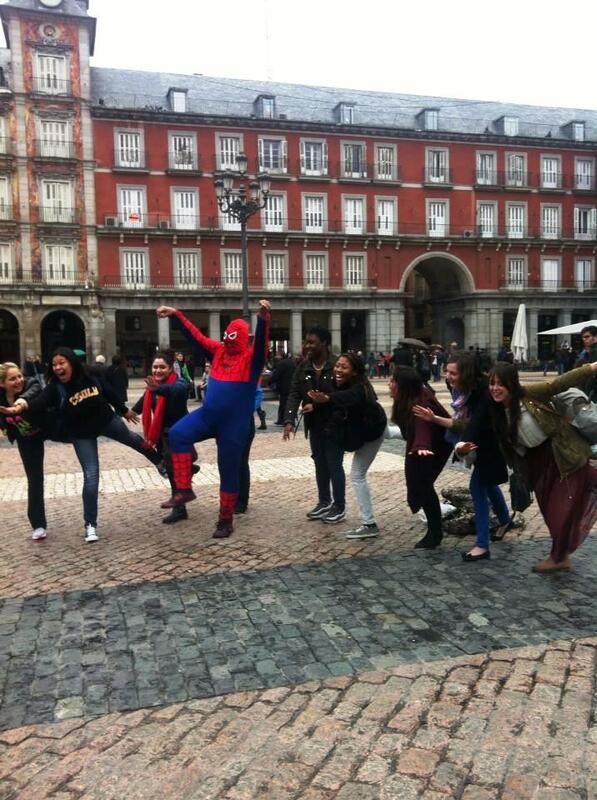 For me, this is an absolute must to do in Madrid. Whether you are on your own, with your significant other, family or friends it doesn’t matter. I used to head here as often as I could when I lived in Madrid armed with my book and a free weekday evening. Head here and then spend some time people watching and wandering around the rest of the park. With your final day in Madrid I would spend the rest of your time walking around in the Sun. My favourite place to do this is in Parque del Retiro. Which comes equipped with an area for skaters, a lake that you can rent a boat to go on, art galleries, cafes & pretty much anything that you could want from a park. I can easily spend my entire day here indulging in all of the activities available. 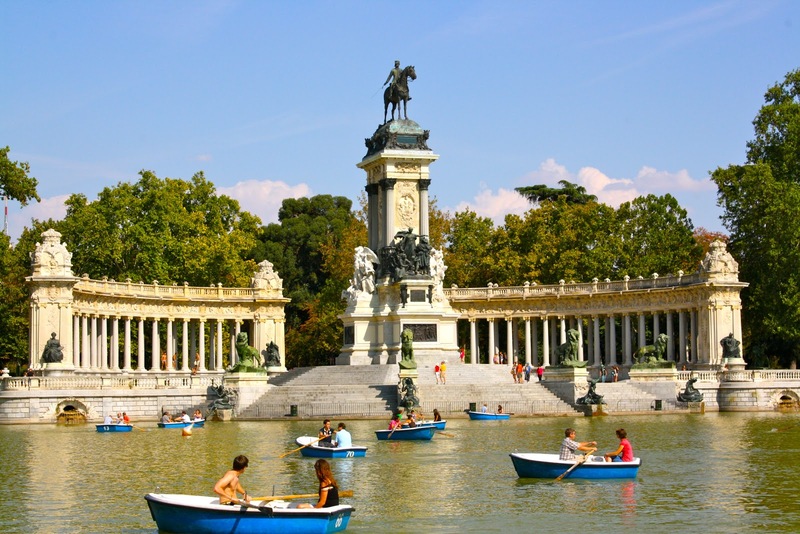 Located pretty close to Retiro Park is what is considered one of the best Museums in the world, the Prado. Full of works of renown artists & also a lovely walk around the building too I would say it’s definitely worth the visit if you enjoy Museums. Note: it is free admission from Tuesday to Saturday between 6pm and 8pm, & between 5pm & 8pm on Sundays. Spend your Sunday days in La Latina. It is always full of people drinking and chatting, and is the only way to spend a Sunday in Madrid. Go and see a Flamenco show, although it can be slightly pricy most tickets with come with food and drink too. Speak to everyone. Some of my best days in Madrid have been from chatting to random people in bars and spending the rest of the day and night with them. Have a good old siesta! Eat all of the jamon, and as much tortilla as physically possible. Learn to salsa dance. A lot of places offer free lessons, it’s hilarious and a great way to work off all that food that you’ve been eating during your visit. Head to Malasana for drinks. It’s Madrid’s closest version to London’s shoreditch. Full of great bars & a buzzing atmosphere. Have beers whenever you want to have beers. Have wine whenever you want to have wine. Wander, wander & wander some more. It’s the perfect City to get lost in! European Boozy Holidays For Grownups | From Europe and beyond. Next post Paris: I’m Sorry, But I Just Don’t Get It!